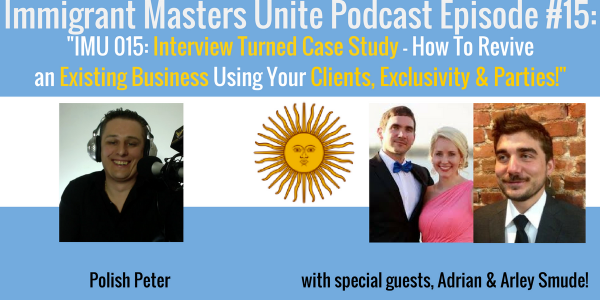 IMU 015: Interview Turned Case Study - How To Revive an Existing Business Using Your Clients, Exclusivity & Parties! | Immigrant Masters Unite Podcast: Transform Your Business, Life and The World Around You! This is Polish Peter and welcome to episode 15 of Immigrant Masters Unite. Today, I have an interesting interview turned case study. When you listen to the podcast, you’ll hear me interview 2 brothers Adrian and Arley Smude whose father immigrated to United States from Argentina. Right now they own a handcrafted wrought iron, garden decor (that even at point had a monkey) local business in Florida. Arley’s and Adrian’s unusual story of how their father started his company on a side of the road and what it was like growing up in an immigrant entrepreneurial household. Listen to these lessons and you’ll hear how parents can influence kids going into different directions of their lives. How you can make your business fun for yourself, your clients and your entire family. You’ll hear what it means for Arley and Adrian to live their business. How to make your business a unique experience for your clients and prospects that will make you stand out from the crowd. Use this one strategy and you’ll stand out from your competition yourself. CASE STUDY: How to take an existing business, in this case a 30 year+ business that stagnated over time and was “left in time,” and grow not only its customer base but revenues without spending a lot of money. Using these “competitive advantage” strategies will allow to revive any business, especially brick-n-mortar business. My top 3 strategies for their business to grow it without spending a lot of money. I talk about how they can utilize their existing data and use their client list to create their perfect client so you can “get into their head” and sell to them without selling to them. How to use scarcity and exclusivity psychological triggers to build selling frenzy for their business.